If you follow me on Snapchat, you saw that I attempted to cook a rosti from Bon Appetit. I think some things are better left for the pros, ya know? 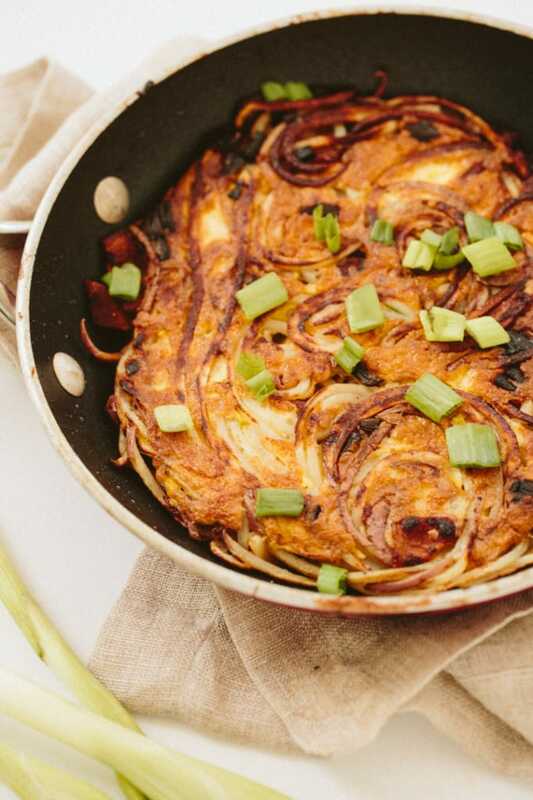 A rosti is like the Swiss version of hash browns. I was very excited to make the recipe, but it was too darn hard to flip – I kept burning myself and screaming expletives, so I gave up. Instead, I decided to make a mini version (perfect for two!) This way, you don’t have to deal with inverting anything into a plate and then transferring it back into the pan and blah, blah, blah. This recipe is easy and quick – and doesn’t require any pre-cooking of the potato noodles- simply add the noodles, bacon and scallions into a skillet, pour over the egg and let cook for 15-20 minutes until the potato noodles are cooked through. I’m a big hash brown gal, but I hate that when you go to a restaurant, hash browns are usually always cooked with butter and they leave that greasy taste in your belly. This mini hash brown cake gets all its fat from the bacon, so there isn’t much extra cooking fat needed. Serve this alongside scrambled eggs, baked beans, breakfast sausage or even some sauteed spiralized apples for a diner-quality meal! Cook the bacon in a medium nonstick skillet over medium heat, stirring occasionally, until bacon begins to brown, about 5 minutes. Reserve about 1 tablespoon of scallions and then add in the rest to the skillet and cook, stirring occasionally, until bacon is crisp and scallions are soft, about 5 minutes. While the bacon cooks, spiralize the potatoes with Blade D and set aside in a large mixing bowl. Once bacon/scallion mixture is done, add to the large mixing bowl and toss together and season generously with salt and pepper. Let cool for 2 minutes and then add in the egg and toss again. Heat a small 8” skillet over medium-low heat. Once heated, add in the potato noodle mixture and pat down with a spatula. Cook for 5-7 minutes. 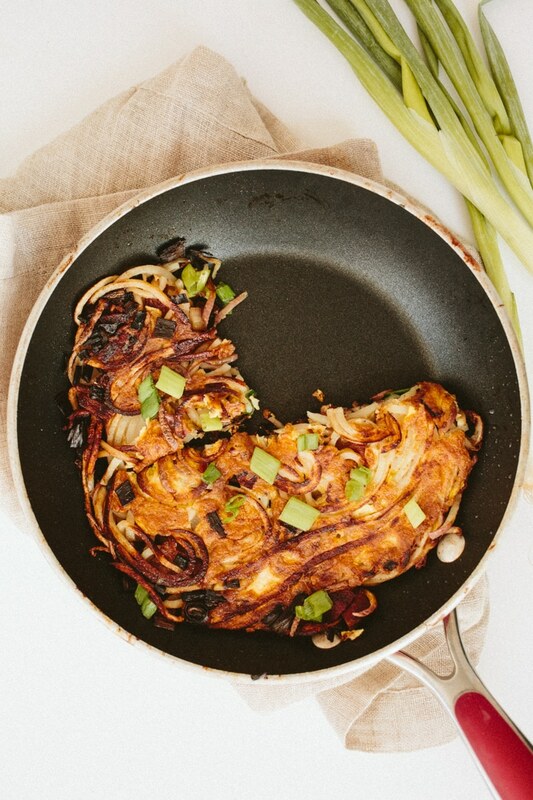 Then, put a plate on top and flip the skillet over and empty the noodle cake onto the plate. Then, add the olive oil to the skillet and slide the potato cake (browned side up) onto the skillet and let cook for another 5 minutes or until potatoes are cooked through. While it cooks, press down with the spatula to compress the potatoes. 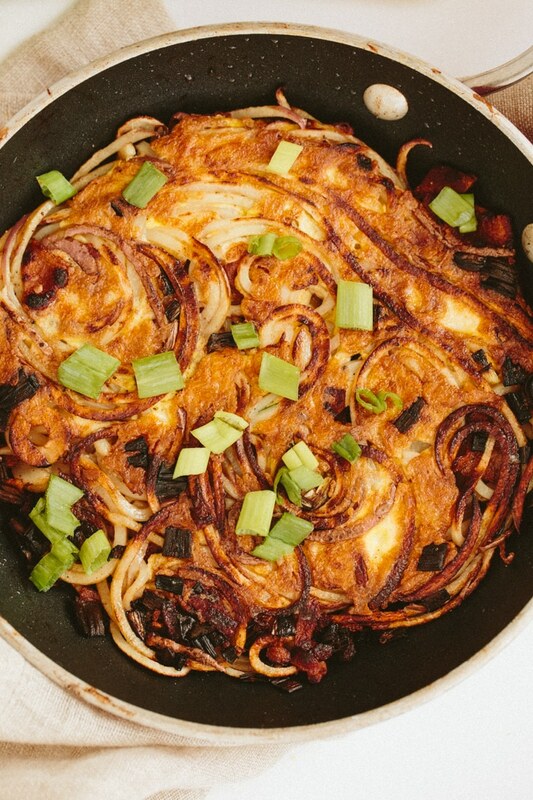 Transfer the potato cake to a serving dish and garnish with reserved scallions. 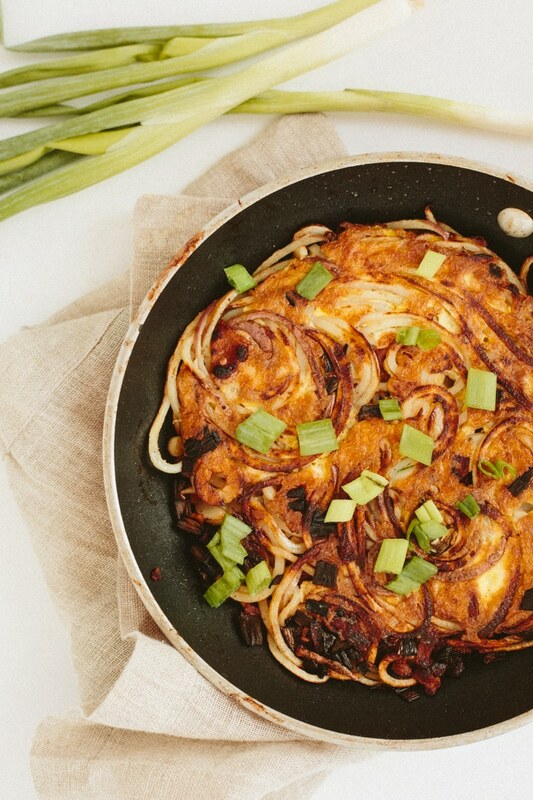 A giant potato cake is something I'm TOTALLY on board with! I saw your snaps yesterday, it looked like it was quite..challenging, haha! 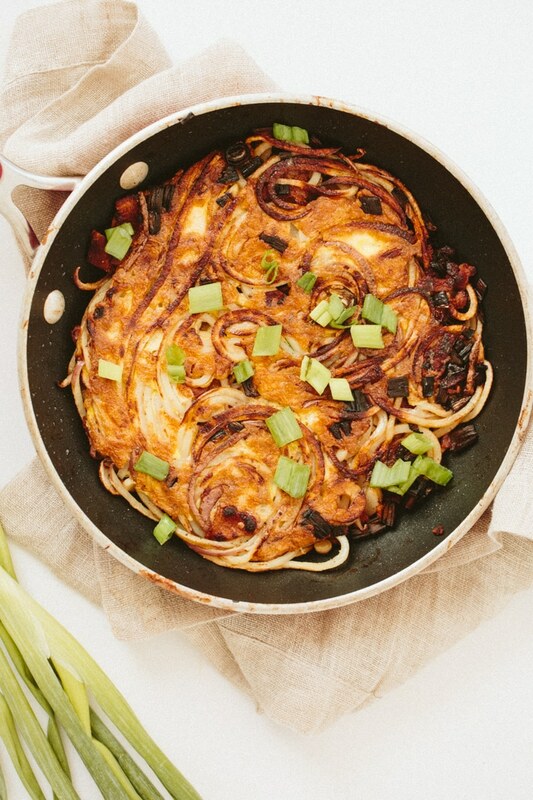 It says this: "This recipe is easy and quick – and doesn’t require any pre-cooking of the potato noodles- simply add the noodles, bacon and scallions into a skillet, pour over the egg and let cook for 15-20 minutes until the potato noodles are cooked through." But there is no egg listed in the recipe. Is the description for a different recipe? Thanks! I updated the recipe! Sorry about that! Also wondering about the egg listed in the recipe, but not in the ingredients. Is it to help brown the potatoes? This recipe sounds wonderful, but I can pretty well guarantee you that I would not be up for cooking it for breakfast. It would be for lunch or dinner, when I have the energy to cook. I've done something very similar and used it as a pizza crust. Was delicious! This sounds amazing and something my husband will LOVE!! However, as a 'Weight Watcher', I'm not sure your Nutritional numbers are correct. I ran a WW calculation to see what the "Points' would be and I think your numbers are if this is made as 4 servings?? 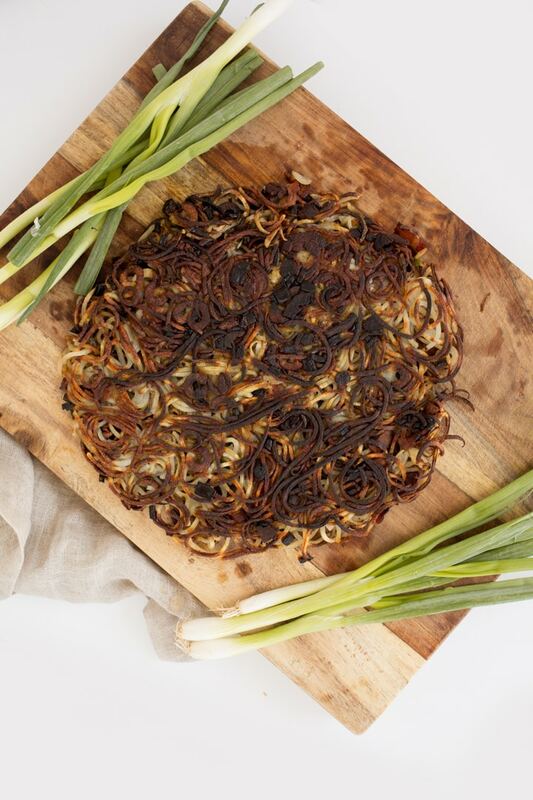 Thanks for sharing your "rosti fail" but I have a pan that would have helped the process. My pan is a fritata pan from Williams and Sonoma and I love it. That being said, I'll still try your mini hash brown cake and I printed on the back of your Spiralized Potato Noodle Kugel that was yummy. I'm chuckling about your adventure with rosti. We loved them when we were visiting Austria. Then we went to a cafe that had a rosti bar like we've seen omelet bars; with all sorts of toppings to be added. When we saw how rosti is made we knew why we thought they were so good. They had at least 1/2 inch of butter in the bottom of the pan and just cooked those shredded potatoes and grated onion until it was browned into a solid patty on the bottom, like one huge french fry. Of course then it wasn't hard to turn. No wonder we thought it was so good. Yours will be much better. Hi, this looks delicious but I'm vegetarian, you think it would be worth trying without the bacon? Any subs you recommend? Anita - definitely, I think it would be great! However, you'll need to add in a cooking fat - like olive oil, instead of bacon. Try 1.5-2 tablespoons when you cook the scallions! This would be a great dish for a "breakfast for dinner" night! I'd add a dollop of sour cream or some really good shredded cheddar cheese. Sounds fabulous, Kerry! Great idea. This recipe definitely has some great possibilities! I sometimes like to make a egg Florentine quesadilla for breakfast, with an over-easy egg, creamed spinach, and a little Parmesan in a tortilla shell. I bet this hashbrown would make a very tasty bottom - and no tortilla shell! Thanks! Made it tonight, with red onions and olive oil, great recipe and very versatile!!!! Definitely will be a regular on my dinner rotation. Ali I just made this with Sweet Potato and it was soooo good! Thanks for all you do, you are amazing. Didnt change anything but subbed the potato, and put a tiny bit of organic maple syrup on at the table (about 2 tsp). It was so wonderful! 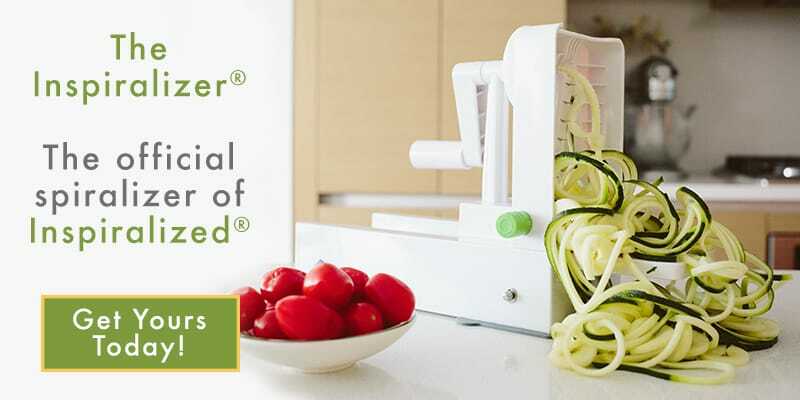 I love my spiralizer and I read your site every single day.